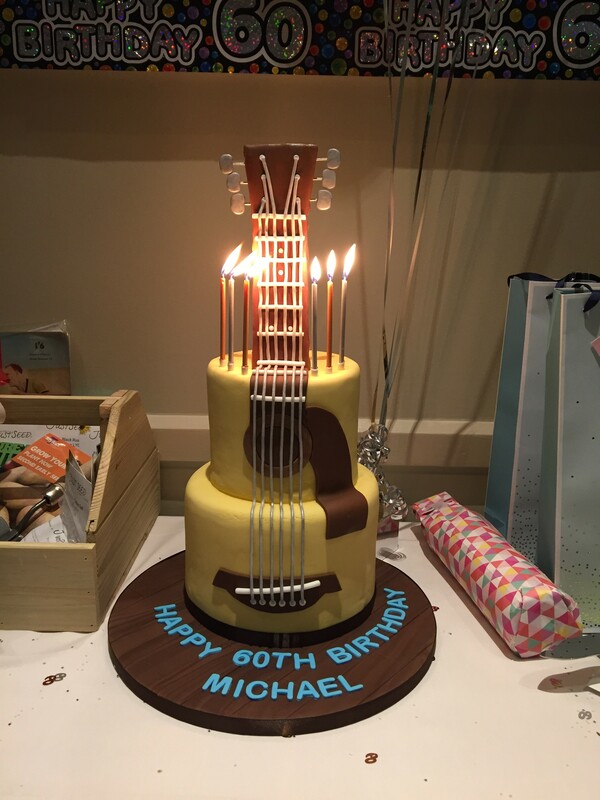 My most recent cake for an important birthday was for James’ dad Michael’s 60th, which fell on a Sunday this year. The Saturday before, he held a big party for loads of friends & family, & had The Counterfeit Beatles provide the night’s entertainment. Michael is a huge Beatles fan, & a huge music fan in general, so it was obvious his cake should be along this theme…. 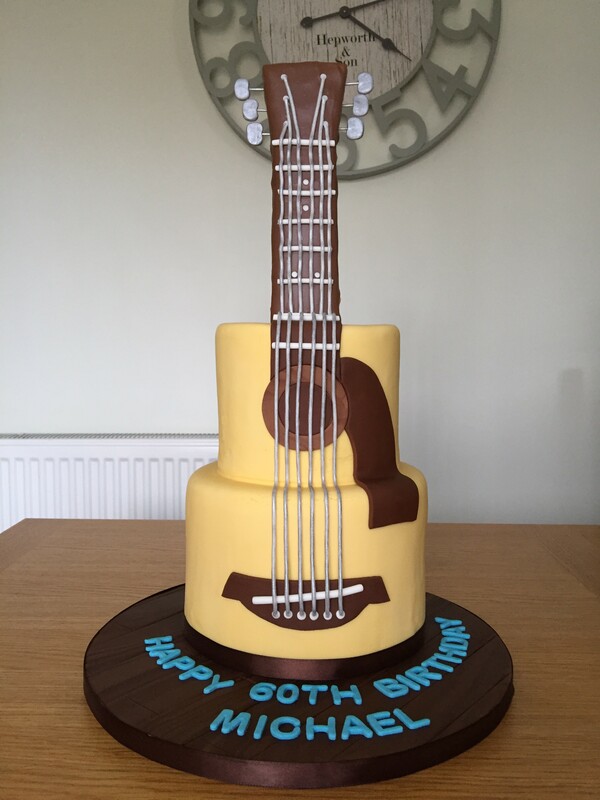 As Michael owns 6 guitars I decided a guitar cake would just be ideal for him ☺️ Inspired by a picture I saw on Pinterest, I planned to bake a total of 8 sponges to make the body of the guitar on two tiers. I then decided I would have to ganache them to get nice straight edges, which I knew would take me ages!! So I set aside a whole day to make my ganache in the morning, allowing a few hours for it to thicken up at room temp, and then to fill the cakes and cover them (as well as lots of my kitchen – ganaching is such a messy job!!! 😂). I managed to create two lovely straight-sided cakes ready to cover with fondant, but then the problems began!!! I found it really difficult covering the cakes – I’m not sure if it’s because they were taller than usual, or perhaps the ganache was too cold when I tried to put on the fondant, or if I overworked the fondant kneading the colour paste into it, but either way I did a pretty bad job!! 😟 Thankfully I could use the classic trick of making the ‘ugly’ side of the cake the back, & kept this side against the wall so no body would see it!! 😜 But, I definitely need some more practice at this. 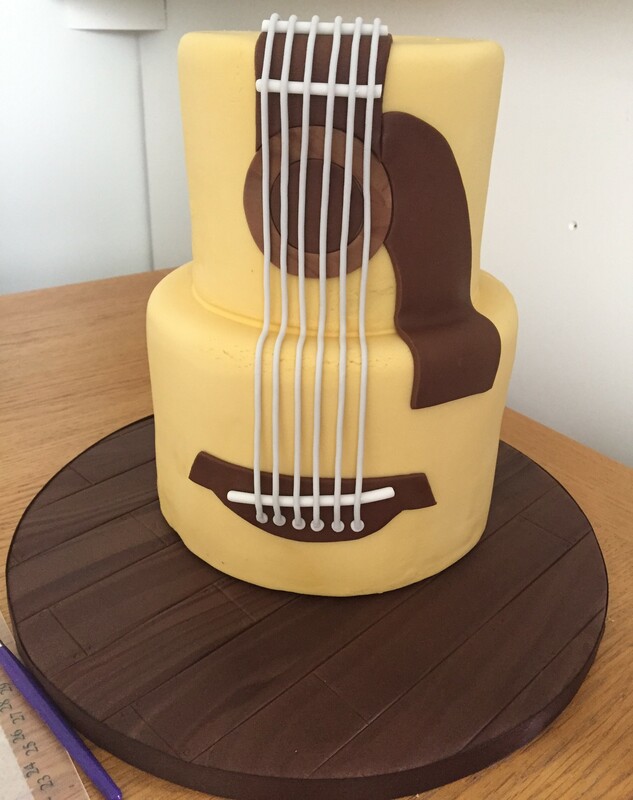 So, the next step was the head & neck of the guitar, which I really wanted to be edible, so the whole thing could be consumed 😁 Luckily I had a friend come up with the solution as I was telling her about my plans….! Louise suggested shortbread would be good for this, as it would be quite strong. I had never made shortbread before, but after googling the recipe I thought it looked easy and was the ideal solution 😀 I covered it in melted chocolate too, which created an ideal colour, but I thought might also help strengthen it a bit. I spent quite a while doing all the decoration, including attaching individual fondant ‘strings’, which I then painted with edible silver paint. I was so pleased with the end result, but also pretty nervous it might not survive the journey to the party! Ready for Michael to blow out the candles!